Rainbow Beach marked the starting points for my next adventures. 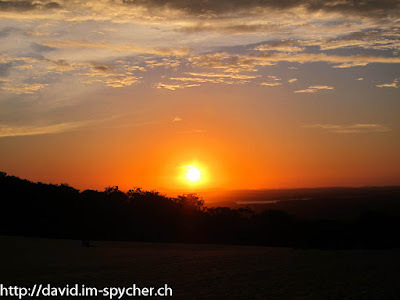 First we undertook a short walk to Carlo Sandblow, a huge sand dune just next to the village, for Sand-boarding and a wonderful Sunset. 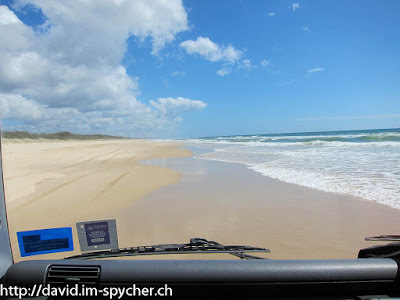 One of the main attractions of Fraser Coast is Fraser Island. An island consisting completely of sand, but with rivers, lakes and a rainforest on top! The only way to get around this island is with a 4WD and so I ended up joining a day trip in a small off-road bus. 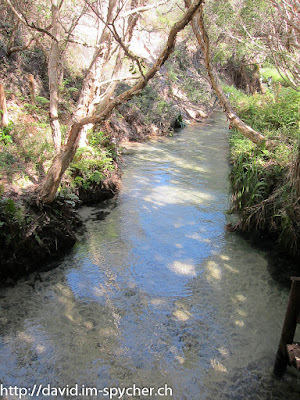 It was a very strange feeling, when the bus drove along the beach just shy of the water line. Our trip featured some of Fraser Islands most scenic places, such as Lake McKenzie, colorful sand piles, a shipwreck and two creeks. 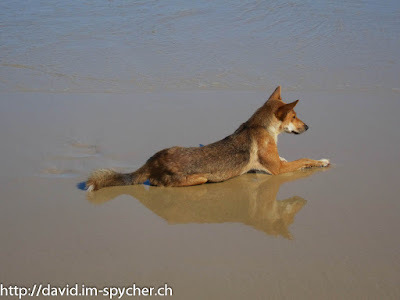 Fraser island is also well known for its Dingo population, which due to it's isolation from the main land is the purest breed of Dingo in the wild. On our way back we spotted an individual who was walking along the beach. He wasn't intimidated by us at all and even lay down, pointedly ignoring us. Due to strong winds my planned dive trip to Wolf Rock had to be cancelled and so I drove up to Bundaberg early for some Caching and to visit nearby Mon Repos Beach. That small stretch of land is a breeding ground for Loggerhead and other Turtles. The turtles come on land between November and January to lay eggs and the young turtles hatch between January and April. The trip started at 7pm with a breefing about the history of the site and the Turtles. After a short wait we were called to the beach, where a Loggerhead turtle was seen. 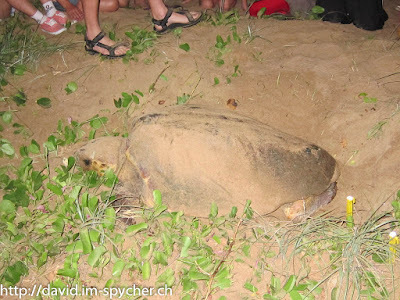 We could get very close to the turtle and watch how she built the nest, laid the eggs and covered everything up again. "Our" turtle was a first time breeder, making her around 30 years old, and she got a tag from the rangers so that she could be recognized and monitored on further visits. Even though it would have been great to see the turtles hatch, it was still an amazing experience.